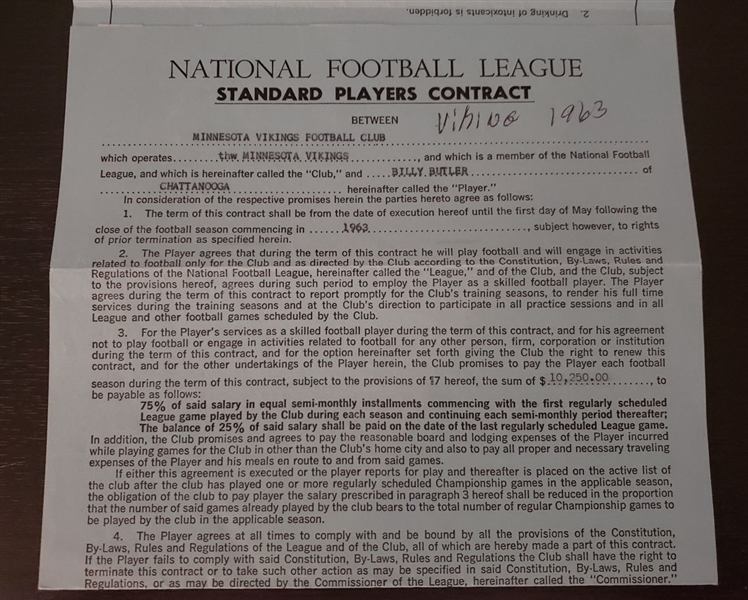 Item Detail - Bill Butler Signed Minnesota Vikings NFL football Contract with Bert Rose Jr.
Bill Butler Signed Minnesota Vikings NFL football Contract with Bert Rose Jr.
Bill Butler is a former Safety in the NFL and CFL. He played for the Green Bay Packers, Dallas Cowboys, Pittsburgh Steelers, and Minnesota Vikings. He continued his professional career in Canada with the Saskatchewan Roughriders for his final professional season in 1965. 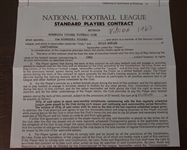 Offered is his 1963 NFL football contract with the Minnesota Vikings. In 1963, Butler was the the team leader in kickoff (33 returns - 21.6 average) and punt returns (21 returns - 10.5 average). 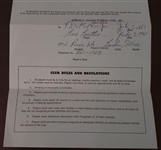 Signed by Butler and Bert Rose Jr. (D. 2001) who was the very first General Manager in Minnesota Vikings history and a super tough autograph. Additionally, he was named the first GM of the New Orleans Saints.